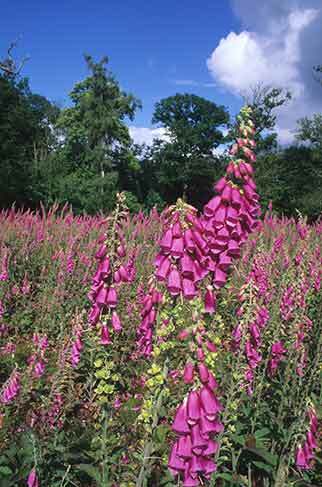 The first foxglove blooms - large, strikingly handsome, pink-purple, down-turned tubes; speckled within, with irregularly shaped reddy-purple, white fringed spots - appear in late May or early June and brighten the woods until, by August, only those at the very top of the stem are present. Bees and other insects are regular visitors that appreciate the flowers' copious supplies of nectar. Insects are also said to take shelter from cold and wet within the drooping blooms. Relatively common and widespread in many New Forest woodlands, where the generally acidic soil suits their habitat requirements, foxgloves are tall, biennial or short-lived perennial plants whose winter leaves form a fairly conspicuous ground level rosette. The single, un-branched, upright stem appears and starts to grow with the onset of milder, spring weather, accompanied by further broadly lance-shaped leaves that become progressively smaller the further up the stem they occur. In days long gone, foxgloves were greatly valued for herbal and other uses. John Gerard recommended them for those 'who have fallen from high places', whilst John Parkinson, apothecary to James I and Royal Botanist to Charles I, suggested use of the bruised leaves for 'scrofulous swellings and the cleansing of old sores and ulcers'. Nicholas Culpeper, meanwhile, in the 17th century, was of the view that '..an ointment of it is one of the best remedies for a scabby head', and noted that 'it has been found by experience to be available for the King's evil' - an unpleasant complaint described as 'kernels by the ear and throat'. Perhaps more plausibly, though, a pioneering study of the medicinal use of foxgloves by William Withering, an eighteenth century botanist and physician, led to the eventual isolation and purification of digitoxin and digoxin, both of which are used in modern medicine as heart stimulants in the drug digitalis. If taken internally, the whole plant is extremely poisonous. It is also apparently unpalatable to taste, which no doubt explains why foxgloves are avoided by New Forest ponies and other animals.